With Valentine's Day tomorrow, we took some time to meet and chat with some of our friends and have a conversation about loving our kids well. As moms and women, our lives quickly get busy. Our days get filled with appointments, meetings, commitments, sports, lessons, jobs and it’s important to take time and converse with those you respect and love. Moms can be ruthless and judgemental of each other at times and it’s important to remember that we are all different. We are not the same, we don't have the same kids and we are all going to raise our kids a bit differently. 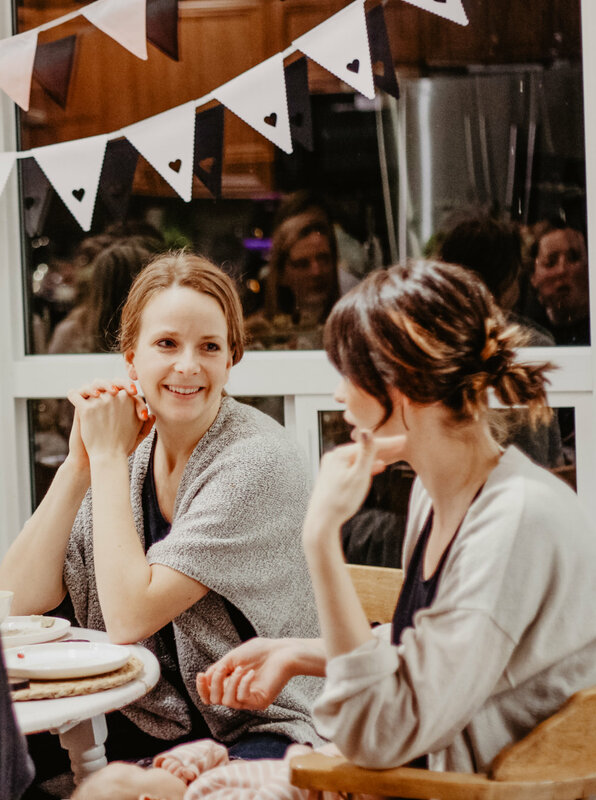 However, there is such value in just listening to each other, encouraging one another and learning from one another in this journey called motherhood. We treated our guests to some home made treats. All of our food was EASY to prep and delicious. All of our ingredients were from Choices Markets, including this delicious cashew spread by a local company, Spread 'Em Kitchen! If you haven't tried their line - you need to! A Valentine's party wouldn't be complete without CHOCOLATE! Our friends at Purdy's sent us some gorgeous foil wrapped chocolate hearts. They were delicious! Can you believe it if I said we actually grew up on Purdy's chocolate! Our mom would always gift us with Purdy's bells at Christmas time and now it has become tradition. All of the food for the evening was picked up at Choices Markets - my favourite local grocery store. They carry so many great brands and items that I can't find at other grocery stores so Choices Markets is usually our go to. It also has that neighbourhood market feel which keeps me coming back. The employees are literally so kind and helpful, it actually blows me away each time I am there. You can find all the recipes to the food you see here up on an earlier blog post here. Fresh florals: the key to any party. We rarely put on any event without fresh flowers and these ones were beautiful from Flowers & Company in Langley. They add so much beauty and colour to a dinner table and our favourites this time of year for Valentine's Day have to be tulips and hyacinths with a bit of seeded Eucalyptus. Flowers & Company is an adorable store right beside Superstore in Langley and they are always so creative and passionate when it comes to florals. Most people incorporate flowers into their centrepiece of their table which we love. However, we also love sprinkling in flowers on cake stands, in baskets and even a sprig on a plate to bring in some beauty and texture. Aren't those bowls from Canfloyd just the cutest?! The plates are from Maxwell and Williams who make such quality homeware pieces that take anything you are serving from plain to beautiful! 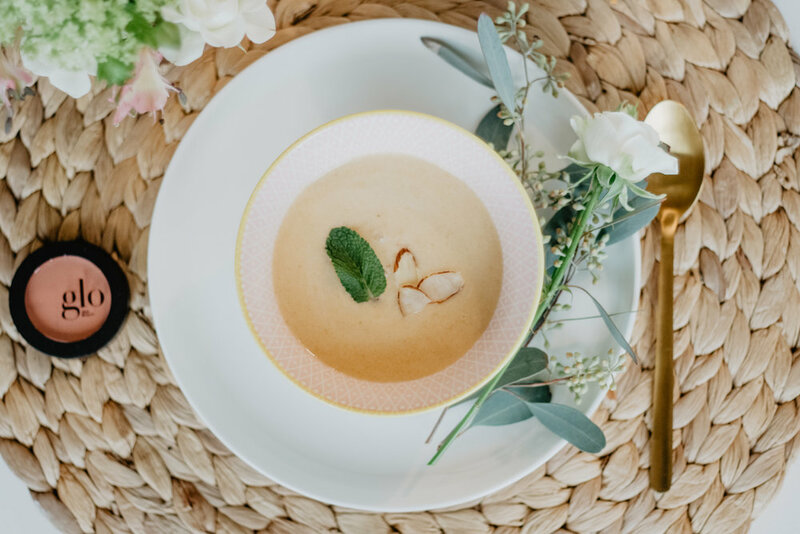 We use so many tableware pieces from Canfloyd (like those gorgeous gold stemmed candle stick holders) and Maxwell and Williams (plates and mugs) both for eating and decor! Multipurpose :) We loved using this two section blush serving plate from Canfloyd to display our valentines cards for our kids. For this evening, we also wanted to create a space where we could spend some time making Valentines for our kids. 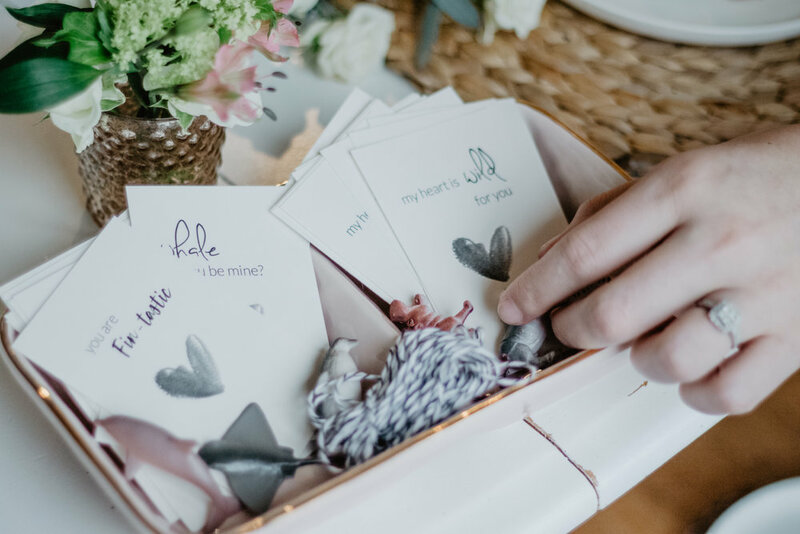 We partnered up with Battat to include their Terra Mini Animals along with a Free Printable we made, to create a simple Valentine for each of our kids. We attached the animals to the paper with a bit of string and wrote a little love note on the back! It wouldn't be a proper Valentine's Day celebration without sharing some love to the ladies. Our generous friends at Glo Skin Beauty, Fruits and Passions and Kind Snacks shared some of our favourite things with our guests. Glo Skin Beauty (formerly Glo Minerals) is an amazing skin care and make up line that we have come to use every day. We were chatting with our friends at the evening and Glo Skin Beauty was loved by many ladies at the table. Specifically, Glo Skin Beauty offers a powder blush and a cream blush. I love the traditional powder look, but I was so impressed with the vibrancy of colour in the cream blushes. You only need a tiny bit for a pop of sun kissed cheeks! Fruits and Passions sent us the most gorgeous hand soap and foaming bath products that we displayed in a gorgeous copper wire basket from Canfloyd. I use their hand soap and dish soap every day because they smell divine and leave my hands feeling smooth and soft - no grime! These women love their children unconditionally. I am constantly inspired by their knowledge of parenting and creativity as a mother. 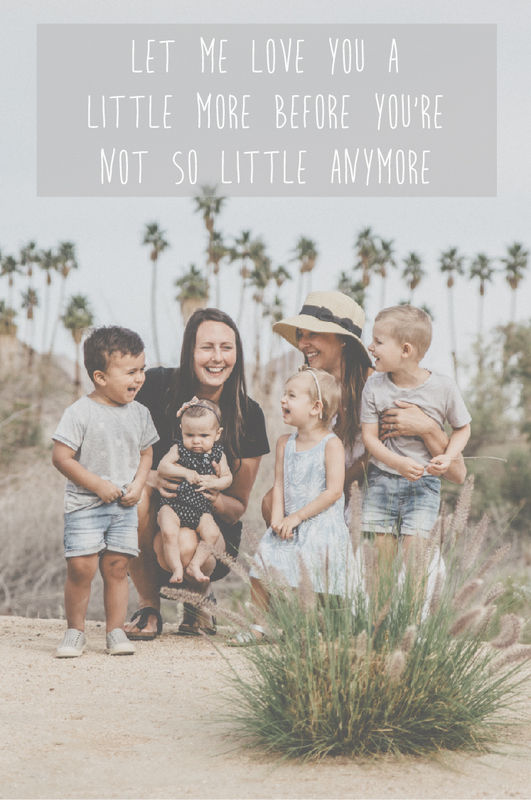 With our kids there are sleepless nights, tantrums in grocery stores, different personalities, funny quotes, moments to laugh about and moments to cry about. However, all of these woman support other mothers in their journey through encouragement. It is so important to be each other’s champions, to listen and to lift up one another as we navigate this journey called motherhood. I feel incredibly blessed to have these ladies in my life and this night reminded me that there is always someone to call for advice, for a shoulder to cry on or for someone to laugh with. It wouldn't be a complete party without a few statement decor pieces from Talking Tables. You can find their products here in our local Chapters and this white heart pendant banner was perfect for Valentines day. We used Talking Tables' pastel crepe paper streamers to create a gorgeous statement backdrop you can see in our Instagram. They have so many different themes for children, events, baby showers etc. Happy Valentine's Day to you from us! Smile at someone tomorrow, hold the door open for someone at the grocery store, drop off some flowers at a friends and hug your loved ones extra hard tomorrow! Spread the love.